Availability: Please allow 3 weeks for shipping! The new racing inspired FKR cartridge kit has technology derived straight from the Moto3, Moto2 and World Superbike championships developed by our engineers at Öhlins HQ in Sweden. The new FKR is the cartridge kit to have for riders who demands the best performance from their bike. Designed for high-end top level racing in SuperStock and SuperSport classes, the new FKR cartridge kit will give you loads of performance. It comes as ready applications for the large displacement hyper sport bikes! The FKR Cartridge kit features a spring pressurized system, compared to the old gas pressurized system, the spring pressure offers a more simplistic and user friendly design. That also accounts for easier maintenance and setting changes. But there are more advantages of a spring pressurized system. There is no risk of gas leakage, it also gives a more consistent performance curve and allows for a more compact design. The Öhlins engineers decided to completely transform the FKR to its predecessor. 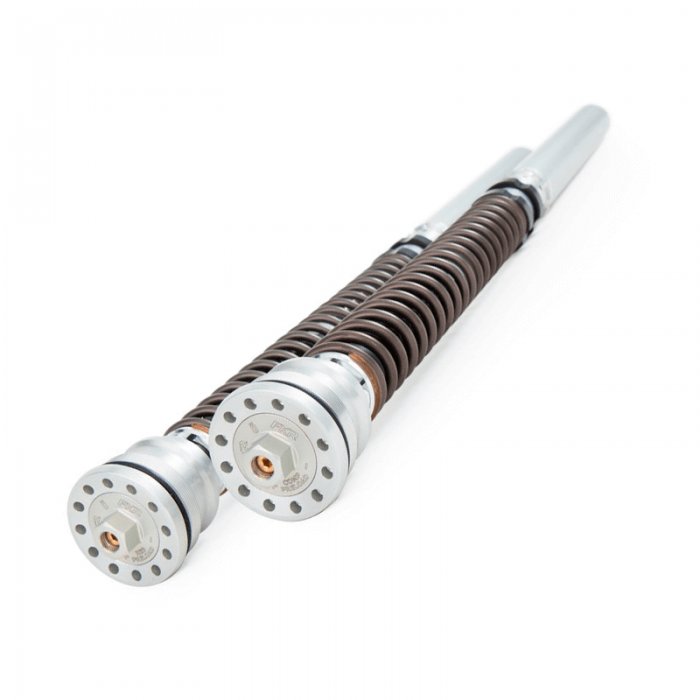 With the Öhlins TTX technology, a new designed piston and an 8mm piston shaft we reduce the pressure build-up and create a faster damping response. That gives a “linear” style of damping characteristics which create more tuning options and also Increases grip & bump absorption properties while improving chassis stability. The Öhlins engineers also decided to make the FKR less sensitive to shim changes making it easier to fine tune the cartridge kit to your specific liking and for different tracks if you are racing. Availability Remarks: Please allow 3 weeks for shipping!